One of the motivating factors for My 52 Weeks of Worship Project is a desire to soak in the kindness of strangers as a means for healing and connection. A project, started by a friend and colleague, Ed Duffy, embodies the spirit of the kindness of strangers. Ed, among other things is a digital storyteller, and one of his specialties is the spirituality of storytelling. 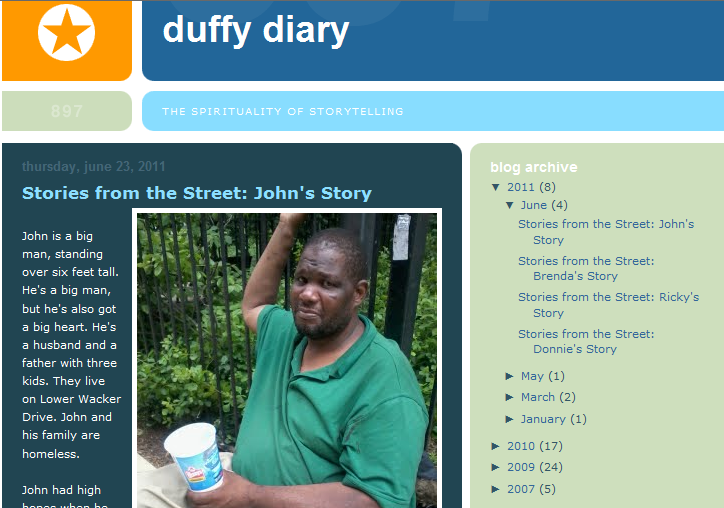 His blog, Duffy Diary, shares the stories of homeless people that he encounters. Ed reminds us that there is humanity in each of us that is valuable and worthy of contemplation. Ed is training for the Chicago marathon, and is in the process of raising $5,000 to help break the cycle of homelessness for women and men in Chicago. Visit Ed’s Blog at http://duffydiary.blogspot.com/ to read about the homeless people that Ed has encountered on his journey; donate to his fundraising efforts at: http://www.active.com/donate/crossroadsrunners/edduffy.